As I was sitting marking my dearly beloved children's creative writing tonight I happened to notice that the cat formerly known as Barney is attempting to broaden his mind, although it is dad's shelf with one contribution from me for the purpose of art. 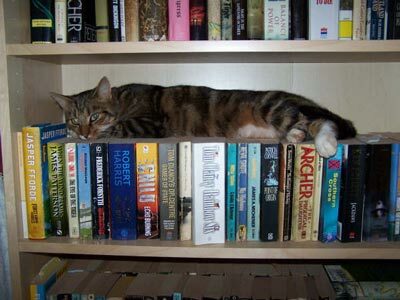 I am sure he would try my shelf, however the books are more creatively stored leaving little room, even for a curious cat. Thus he just sticks to my bed. I just thought I would share this picture with you as it made me think of your books and brought a smile to my face! 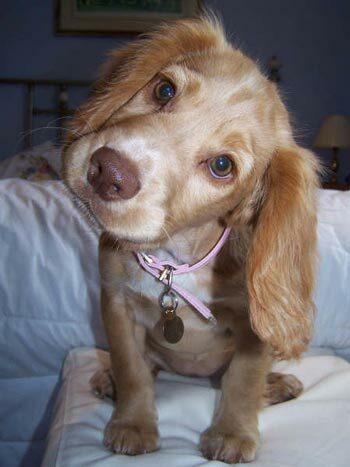 I was just about to send this mesage when Bella the puppy asked that I send you the picture of her looking ever so cute as it happened to be in the same folder and it wouldn't be fair otherwise. Many thanks for the wonderful books and best wishes for the future.